Although I use music from a variety of cultures and traditions regularly in all grade levels throughout the school year, I spend about a month focusing on the music from a particular culture in each grade. Today's focus: the Philippines! I'm including links to the articles on 8 other countries / cultures at the end of this post, so be sure to read to the end for more lesson ideas for world music! I study Philippine music with my 3rd grade students. I always choose which cultures to focus on for each grade based on the content I can reinforce through the study, and in this case I am able to use music from the Philippines to focus on triple meter, and because it has so much fun movement, it is a great way to break up their focus on recorders that they study concurrently. We spend another few classes just working on the movement of the bands without anyone jumping- just close feet on beat 1, then apart on beats 2 and 3. Once we've got that down I will finally have students try jumping with the bands. After a few classes of that, those that are ready get to try it with some real bamboo poles! I was lucky enough to find out about some people that were cutting down some bamboo in their back yard nearby and I stole some :) There is definitely an element of danger (which some students like and some don't), so I make it purely optional and definitely keep a close eye on things (and by things I mean feet)! I use the audio from this video to do our Tinikling with. It is a traditional piece used for Tinikling, but slightly slower than any of the other performances I have heard, so it's perfect for little feet! We also sing and play other songs that we are learning in triple meter, either in the recorder program or songs we have done in class- I've even done it with "Take Me Out to the Ballgame"! It is a great way to reinforce the "feel" of the meter. But my favorite is to use this song from the Philippines, also in triple meter, called Bahay Kubo. On Mama Lisa's page, you'll find the music notation, a sung recording, and lyrics in Tagalog and English. I've found the students are able to learn it relatively easily, and it is a great way to incorporate singing with the Tinikling movement. I usually have half of the students sing while the other half are doing the Tinikling- it is a great way to give students a chance to catch their breath! That's everything I teach for music from the Philippines. 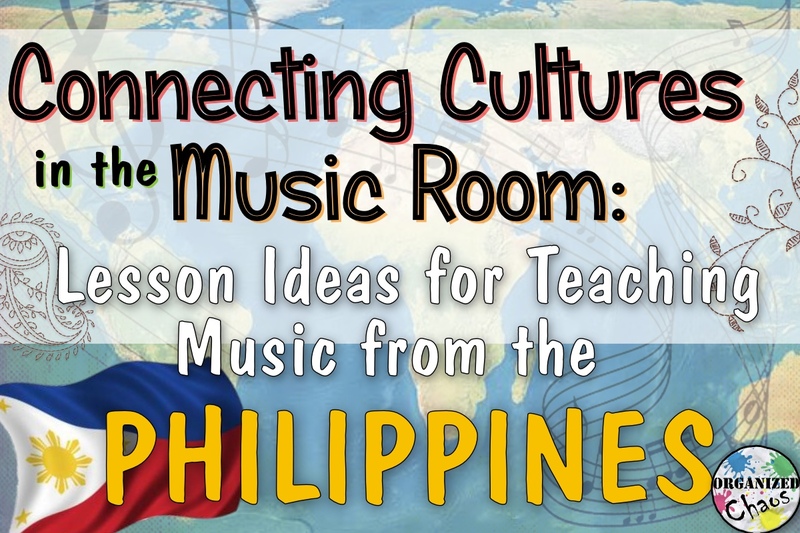 Do you teach Philippine music in your class? I'd love to see any additional ideas and resources you have in the comments below! Want more? Subscribe here to the Organized Chaos newsletter and get music teacher ideas and resources sent straight to your inbox! Found your Friday Linky Party on a search! STOKED to link up with a music teacher!! Many thanks for hosting!